The coloring of this lustrous disk is uniformly dark and mottled dark reddish-brown. White striations also cover the surface. The mineral of this piece appears to belong to the dense serpentine found in the Northwest area. Though round and even, the edge is broken in two small areas. 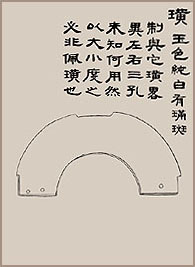 The poetry of the Ch'ien-lung Emperor (r. 1736-1795) was carved along the rim. Like the pi disk above, this lustrous ts'ung tube is dark and mottled dark reddish-brown with white striations. It too appears to be the dense serpentine mineral found in the Northwest. This object is round inside and has a square outside even on all four sides. The neck is somewhat short, and the mouth inside is round inside but not outside. The mouth was cut at a slant. The outside form flares slightly, but the hole inside is straight and smooth. The poetry of the Ch'ien-lung Emperor was engraved outside the neck of one end. 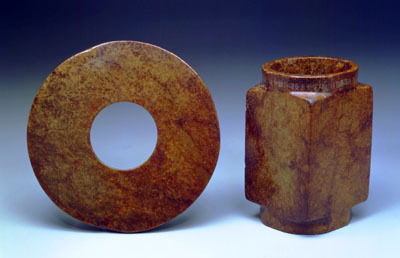 This tube and the disk above were cut from the same material and exhibit the same type of carving. 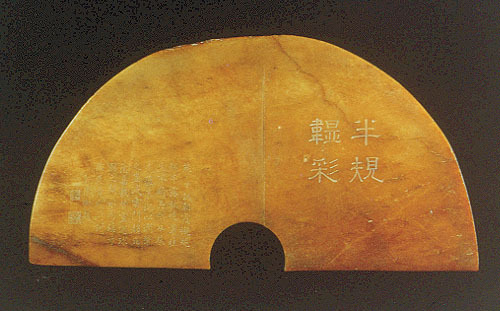 Both pieces also bear the engraved inscriptions of the Ch'ien-lung Emperor, but the contents do not indicate that the emperor knew the relation between these two pieces. It is unknown whether his poems were meant specifically for these pieces or whether somebody in the palace borrowed them to be engraved here. In other words, these poems may not have been composed for these particular pieces. Archaeological data suggests that pi disks and ts'ung tubes were once used in sets in the Ch'i-chia Culture. Excavations from a Ch'i-chia Culture site in Kansu province provide strong evidence. The ts'ung tube and pi disk here were made of the same jade and worked in the same manner, indicating strongly that they were made at the same time. 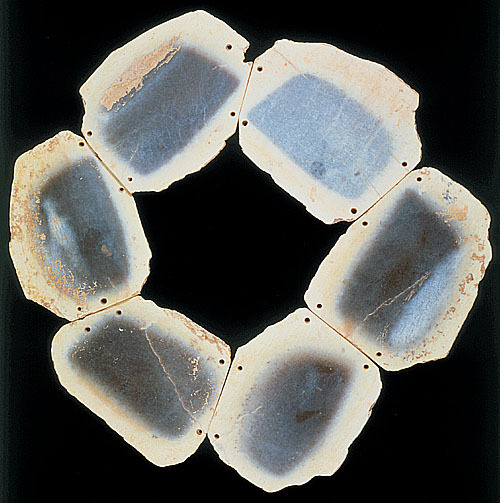 This set is composed of six pieces of the same type of jade all with brownish-white coloration around the edges. The jade inside each piece is dark green with striations. This uniformity suggests that they were all cut from the same piece of jade. These pieces can be arranged to form a polygonal shape (close to that of a hexagon). Two sides of each piece were worked so that the pieces all fit together, and the adjoining sides are either straight or diagonal and were drilled with two holes from one side. The thickness of the pieces differ; some have a protruding side with the other one slightly slanting but even. The traces of a straight line show where the pieces were sliced. The pieces can actually be arranged in several ways, but the most suitable one is as follows; as a rule, the larger of the holes is at the top and a straight side fits against a diagonal side. Some holes appear to have been re-drilled because the original ones broke. As a result, some sides do not match up perfectly. For example, the broken corner of the slanting side of the first piece (as numbered in the link below) originally had a hole that broke (and can still be seen). Also, the third piece differs in shape and may have been reworked on both sides to fit into the arrangement. 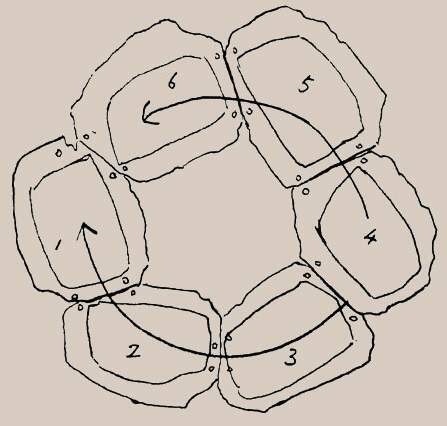 The design of jade circle arrangements is perhaps linked to the formation of stone circles found at ritual centers in the Ch'i-chia culture. 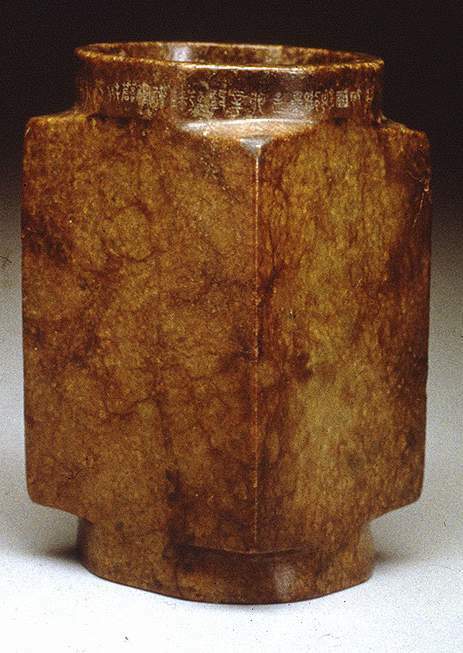 The greenish jade of this piece exhibits striations and banding, and the surface has turned brownish-red. This round semi-circular piece has an area along the upper rim that is damaged, and each side bears a straight line that indicates where it was cut. The hole was drilled from one side, but it is not exactly in half. This suggests either that the hole was not drilled in the middle of the original pi disk or that this piece was intended as a half disk. 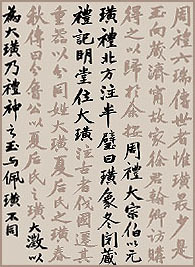 On one side is the engraved poem of the Ch'ien-lung Emperor (r. 1736-1795), and on both sides are four-character engraved inscriptions of the emperor. 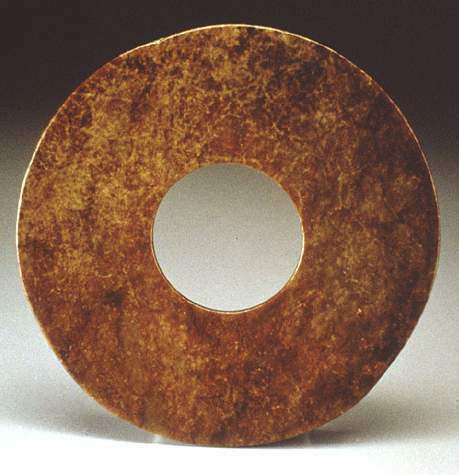 Traditional studies on huang pieces in "Illustrated Study of Ancient Jades"
...mention that "large huang" were half pi disks used to venerate the deity of the north. 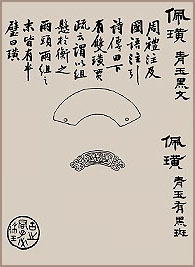 Most of them were worn as pendants on the chest and thus known as "pendant huang".